We are about one hour from Sydney now. The flights haven't been too bad. Luckily we got out luggage checked all the way from KC to Sydney. We watched the Fiesta Bowl at a bar in the LA airport – at least it made the time go by fast. It was a great game. On the flight to Sydney we are in row 71. The plane actually has second deck. We, of course, are not on the second deck, but I thought those just existed in the movies, like in “Wedding Singer.” Even though we are far back, every seat has a personal television screen. We have a choice of different movies, TV shows, and even games. They even serve the meals with real silverware and glasses. I love the accents the flight attendants and captains have although it does make them a little hard to understand. I guess I'll have to get used to it, though. Soon, we'll be setting foot on another continent. Well, technically it's the same day as the last entry, but it feels like it's been forever since we landed, much less since we left KC. After we landed in Sydney, we had to make our way through customs and got Australia stamps in our passports! After standing in long, slowly moving lines, we were told by one airport worker that it was “bloody hot” outside. We were not surprised, though, because we were both sweating in our long sleeves and long pants. Luckily we were able to check our bags and get our boarding passes to Darwin. Then, we kind of cleaned up in the airport restrooms. It's amazing how much better you can feel just by brushing your teeth and washing your face, even if you are still wearing your same clothes from a day and a half ago. Lots of deodorant and several spritzes of cologne and perfume later and we were ready to go explore Sydney. We bought tickets for the train and hopped on the train headed toward Sydney Harbor. There, we walked along the water as we soaked up the beautiful sunshine, the warmth, and the cool breeze. There were street performers, including one man dressed as a statue and one man in full aboriginal garb playing a digiredoo. We strolled by the tables of merchants selling their goods of wooden carvings, stones and jewelry. We took several pictures of the Harbor and the bridge. It was very odd to see in person what we've been staring at in pictures for so long. We decided to take a guided tour of the Sydney Opera House. The cashier, mistaking us for students, gave us a discount, which was truly appreciated. The tour was interesting, though I was surprised at how out-of-date the interior was. You could definitely tell it was made in the 70's. Cory and I both noticed how recent Australia's history is. At least in terms of European/White involvement. This huge landmark of the Opera House was only begun in the 50s and opened in 1973. Even America, which is incredibly young when compared to Europe, has landmarks and a history much older than that. We bought sandwiches at a cafe for $9.50A ($5 US) and had lunch overlooking the harbor, watching the boats and the people. With the ticket we bought for the train, we had free admission onto any of the ferries. Because it was such a gorgeous day and a Sunday afternoon, the ferry was packed. After a while, it cleared out as people got off on the different stops. We were just using it as a tour of the harbor, so we stayed on and eventually got seats. We saw the most gorgeous house built into the sides of the harbor. They were waterfronts with private boat docks. I swear there must be celebrities living there. We saw tons of boats and boaters and many beautiful water sights. After our ferry ride, we walked over to the botanical gardens and sat in the shade, relaxed and watched the people. Cory named which celebrity he thought each person looked like. Later, we continued our walk through the garden. Cory was impressed with the fox-faced bats hanging in the trees, though I was surprised there were not more flowers. Everything was pretty, but was almost all green. We left around 4:15 to make sure we made it back for our flight to Darwin. We got on the train, but soon realized that maybe it wasn't going where we needed it to go namely the airport. The problem was we couldn't understand the person making the announcements. We think we were supposed to have gotten off at an earlier stop. Luckily, Cory saw a sign that told us which stop led to the airport. We got off at it and made our next train, which took all of five minutes to get us to the airport. Flying is becoming old hand to us and I really think our time schedule for our internal clocks is working out, though I guess we'll see tomorrow morning. 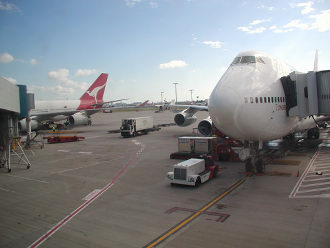 Right now, I'm on the flight to Darwin, it's 8:00 PM Sydney time and I'm not too exhausted. That's something, considering it's 3 AM in KC. So only this last flight and we'll be in the city to begin our bus journey. © RecTeamStats. All rights reserved.